My job takes me into some unique and interesting buildings. We joke that if we get to go up in the elevator, we're doing something wrong. Today, Mike, Jon and I walked a very large project. The purpose of the walk about was to determine where we are going to place equipment for this job. The building we were in was old. It is a warren of rooms in the basement and many have original brick walls. We entered this room and determined it would suit our equipment needs perfectly. I'm documenting the locations for reference. I took the photo and looked at it in the view finder. What the...? I looked at the room. I didn't see any white speckles in the air. Snap another photo and the same thing happened. So I turned off the flash and got a good photo without the speckles. I was quite confused. I looked at my lens and determined there wasn't dust on it. 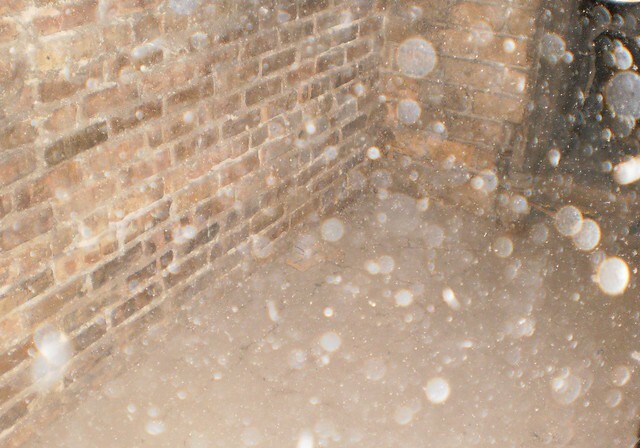 If you believe in ghosts, there is a body of work that suggests the random orbs one will sometimes see on photos are spirits. If this was the case, holy cow. We have a small city crammed into this room under the sidewalk in front of this building. Seeing my puzzlement at my photo, one of our escorts asked what was wrong. I showed him the photo. "Oh yeah," he said. "I meant to tell you to turn off your flash if possible. When you took the photo, the air lit up with dust particles from us walking in there." Dust. Yes, dust. It happened in a couple of other locations later, too. You couldn't see the dust in the air until the flash went off. I'm rather impressed at this little camera's capabilities. That's some mighty fine looking dust there.